Personalize and protect your iPad mini with the hands-free comfort and convenience of the Kensington Portafolio Soft Case. The most vulnerable parts of your iPad are the screen and the corners—especially if you accidentally drop your iPad. 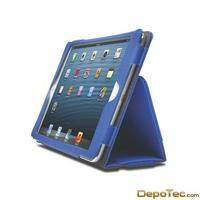 The Portafolio Soft Case has strong corners and edges for vital protection for the corners of your iPad mini. A functional soft screen cover protects your iPad mini’s delicate display against scratches and damage and provides storage for papers and business cards. Simply slide your iPad mini into the Portafolio Soft Case and your iPad mini is protected. The Portafolio Soft Case has a convenient hand strap to make it easy to hold as you read your favorite e-book as well a built-in business card slot to identify the iPad mini as yours. The Portafolio Soft Folio Case has a built-in two-position stand that securely holds your iPad mini upright for hands-free FaceTime chats. Typing emails on your iPad mini? The Soft Folio’s low angle position makes both easier and more enjoyable.